Eric is a charismatic, trusted, and diligent real estate agent who consistently exceeds expectations by listening to and getting to know his clients in order to creatively achieve all of their real estate goals. As a retired Marine Corps helicopter pilot, he has developed a personality of honesty, dedication, and hard work, and his attentive service has earned him the coveted “Best in Real Estate” award four years running. His initiative and attention to detail benefit all of his clients, from wealthy investors to first time homebuyers. 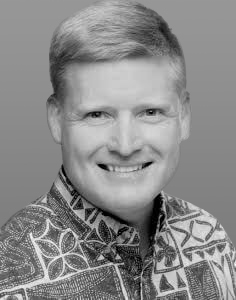 Eric services the entire island, and has a particular affinity for Kailua, where he has lived for the last 18 years. His wife, Stacey, is a first grade teacher at Punahou School, where his daughter, Kaile, is a 8th grader. In his spare time, Eric enjoys paddling, surfing, and attending Kaile’s paddling, sailing, and robotics events. Most mornings you can find him walking Kailua Beach Park with his camera and the family Portuguese Water Dog, Kini.